A defended manor was first established here in the 13th Century by the Manners family, but was only fortified as we see it today during the 14th Century. It remained occupied by the Manners descendants until it was finally abandoned as a home in the 15th Century and by 1542 it was said to be in a great state of decay. Today the castle ruins consist primarily of the gatehouse and the keep. A standing exhibition about Border Warfare and the Battle of Flodden is housed in a former chapel located beside the English Heritage car park. The remains of Etal Bridge are located at the very western end of Etal village, behind Etal Castle and at the terminus of the Heatherslaw Light Railway – at the far end of the platform. Today, only the foundations of the Bridge remain intact, visible when river levels are low. It is known that cannon and infantry were removed to Etal Castle after the battle, almost certainly across this bridge. The Manners family established a manor here in the late 13thCentury. This probably took the form of a fortified tower or farm surrounded by a wooden palisade. In 1341 Edward III granted the family a licence to build crenellations, further fortifying the site against the perceived threat of Scottish invasion. After this the castle began to develop into the form we see today. 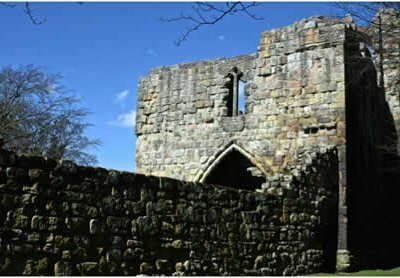 These improvements are likely to have included the development of the gatehouse and the curtain wall, replacing earlier wooden structures as well as the further fortification of the tower or keep. Improvements were not a quick process and fifteen years later the castle was still reported to be ‘under strength’. Perhaps they were never finished as the curtain wall, which surrounded the whole site, linking the gatehouse and towers, was never thickened to more than one metre. The Manners family remained in residence until the 1490s after which the castle was occupied by their tenants, the Collingwoods. Though garrisoned at the time of the Battle of Flodden it quickly fell to the besieging forces of James IV providing him with control of the bridge over the River Till located just to the west of the castle, effectively allowing him to secure his eastern flank against an English attack. After the battle the castle was recaptured by English forces, and it is here that the English Army is supposed to have stored captured Scottish guns and other ordnance in the days following September 9th. The castle was recorded in a survey some 29 years later (1542) as being ‘in a great state of decay’ and in 1547 the Manners family finally relinquished it to the Crown in exchange for lands elsewhere. Though the Crown occasionally garrisoned the site thereafter, it was never substantially repaired. The site was purchased by the Joicey family along with the rest of the Etal Estate in 1908 and was passed into the ‘guardianship’ of the state in 1975. Today the gatehouse and the keep are the castle’s two most intact structures. The gatehouse, constructed during the strengthening of fortifications after 1341, consists of a long gateway tunnel in a two-storey building flanked by two considerable towers. The gate was guarded both by a portcullis and a pair of hinged doors. Outside this there is evidence of a moat and ‘drawbridge’, the cable holes for which can be seen on the front face of the gatehouse on either side of its windows. On the first floor the Captain of the Guard would have had his chamber directly above the entrance tunnel. The entrance tunnel is also flanked by vaulted guard-rooms each with a fireplace and garderobe (toilet). A guard room was located in the southern tower while a spiral staircase in the northern tower provided access to the parapet above the gate. The tower, or keep, at the centre of the castle predates the castle’s official fortification and was probably heavily developed throughout its life. It remained however the very heart of the castle and its primary residence. Its ground floor would likely have been used for stabling animals when the original fortified manor was threatened with attack. Later this may have become a storage area for important supplies. Above was a great hall, which would have formed the social centre of the site from which the Lords of Etal would have ruled over their manor. On the second floor would have been more private chambers, while the third floor would probably have been for the use of the garrison and gave access to the roof. Though not now visible, other buildings would have stood within the curtain wall. Limited archaeological investigations have identified the remains of cobbled floors and ovens. These buildings would have included cook-houses, accommodation for the garrison and servants, offices, possibly a brewery and also stables for both the garrison and the Lord of the Manor. 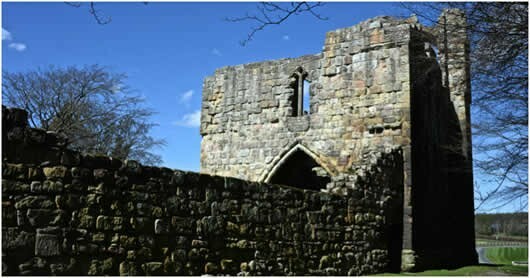 Etal Castle is a Listed Grade I building and a Scheduled Ancient Monument. Toilets (with ramps) in adjacent car park. Dogs allowed (on leads), picnic area, site shop, disabled access, education facilities. Car park adjacent to castle. From Wooler - follow the A697 north through Milfield. After 2 miles turn right on to the B6354 (signposted for Ford and Etal). Follow the B6354 for 1.5 miles, before crossing a bridge and coming to a T-junction. Turn left to Etal and follow the road past Heatherslaw Mill (Site 4) for 1.5 miles. Turn left into Etal Village and the castle is at the far end of the main street. From Berwick - take the B6354 off the A1 and head south-west for 6 miles through the small villages of West Allerdean and Duddo. Etal is 2 miles south of Duddo. Turn right into the village and along the main street to the castle.